Here is how i decided to do it and more importantly how i was able to make a door to cover the hole afterwards. This is what the area looks like. It is located under the passenger side of the rear seat. Area marked off to be removed. For cutting i used a Dremel and their reinforced cutting wheels. Only used 1 1/2 wheels to cut the panel out, just have to go slow. I just marked my lines then went over them slowly working through the metal. In the above pics you can see i already started cutting the one side. Here is the piece once all cuts are made. 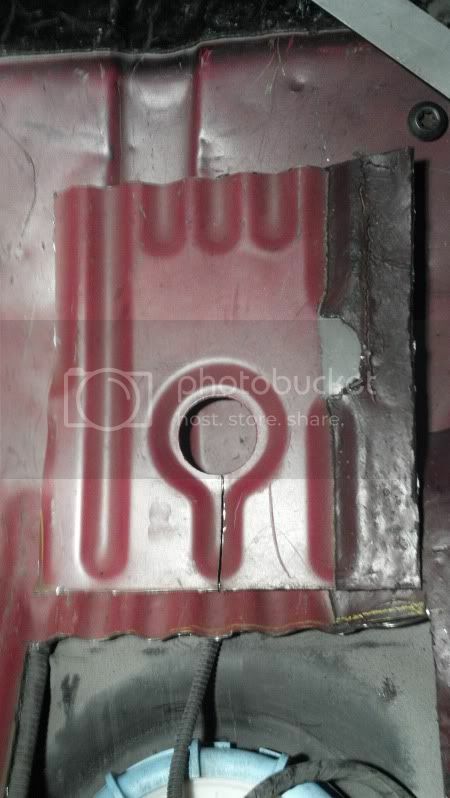 Take notice to the slit cut from the harness hole to the side. 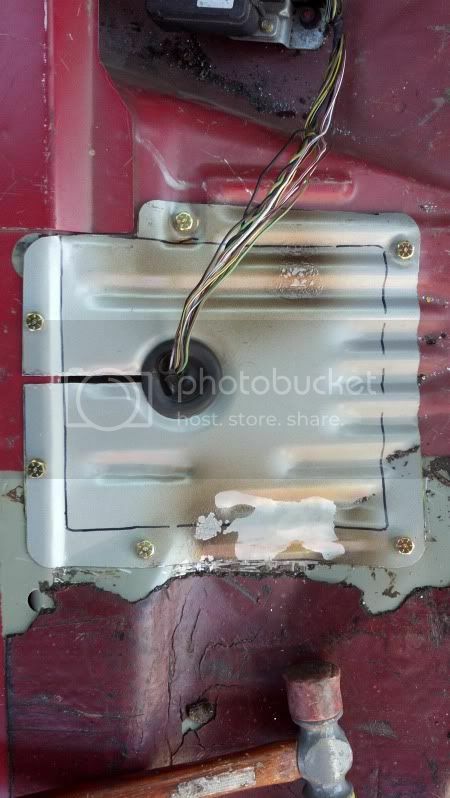 This allows the harness to be removed from the panel you cut. 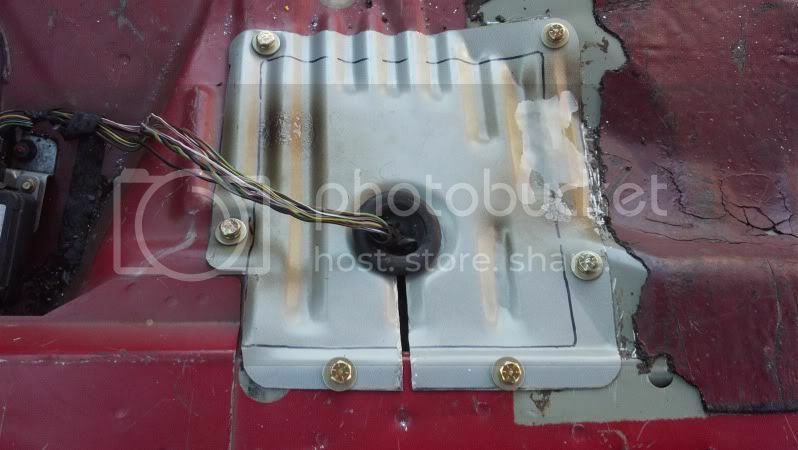 Had to do this because you won't be able to reach all the connectors to pull the harness through the hole. 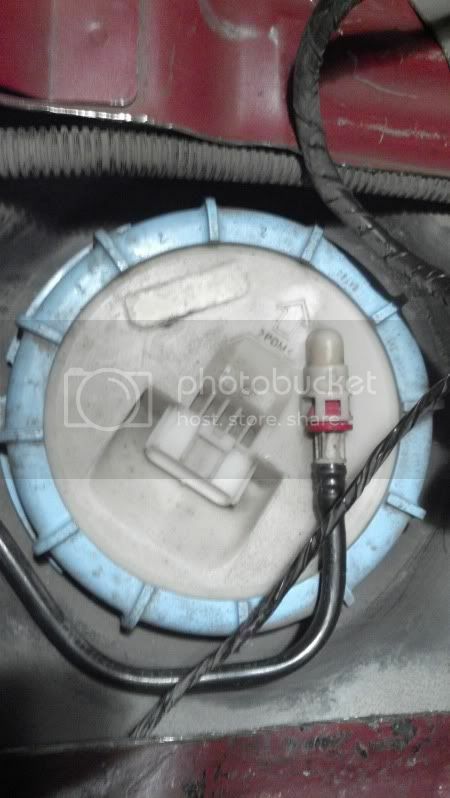 Take note to this evap line which was not snapped into the groove on top of the tank were it suppossed to be. i knicked this and put a small hole in it that i patched with some rtv sealant. In the groove after i snapped it back in there. 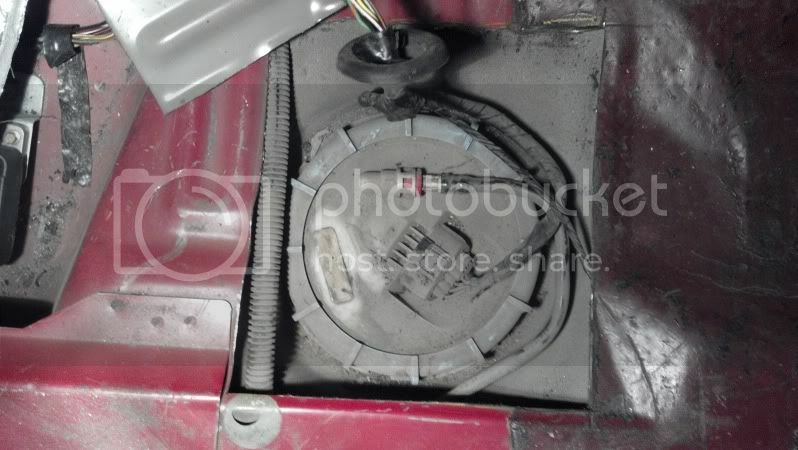 Here is the hole itself and as you can see the fuel pump module that you now have easy access to. Now you will need to clean all of the dirt and grime off of the whole area before opening it up. Don't want to get any of this into the tank. For this i used a nylon brush and shop vac. 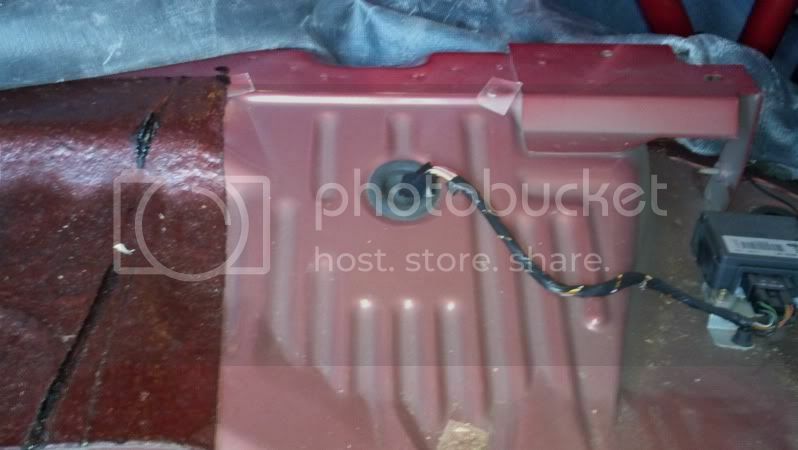 Now to make a door i went to a local salvage yard and cut out the floor pan area above the fuel tank. I cut it over sized so that i would be able to trim it to fit. 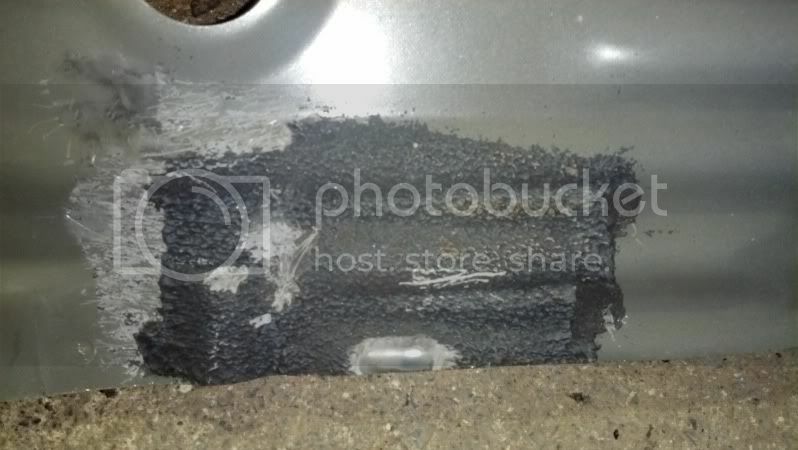 There is some under coating/sound deadner on the underside that will need to be removed. I just used a propane torch and burnt it off. 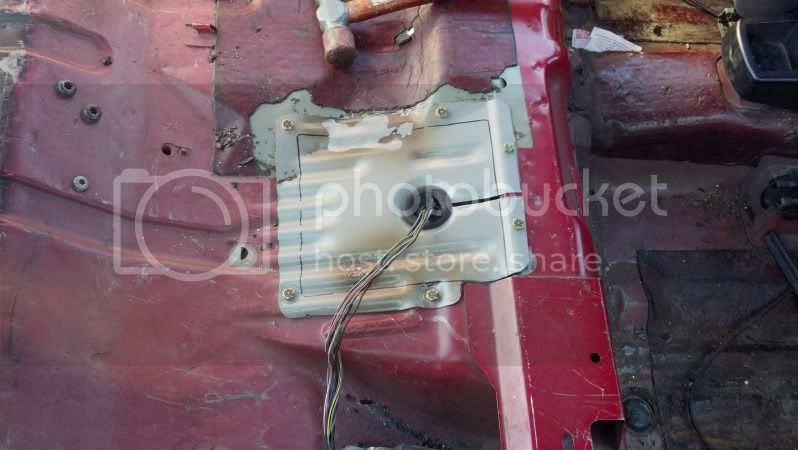 I then used the piece i cut out of the car as a template and traced that onto the piece i got from the salvage yard. I trimmed it 1" bigger than what i cut the piece out of the car. this left me with a flange area that i could then use to re-secure it to the car. i ordered some 1/4-20 rivet nuts from mcmaster-carr. 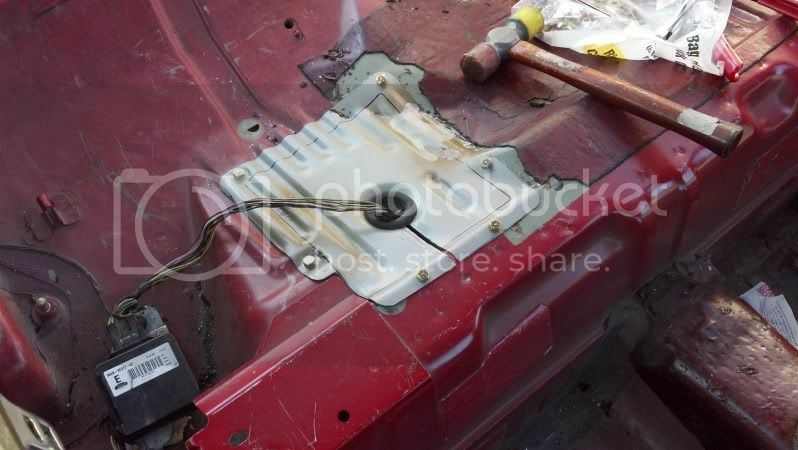 Layed the cover piece in the car and drilled 1/8" holes through the cover and just let the bit hit the floor to mark it where to drill. i then used a stepped drill bit to drill the holes for the rivet nuts. Riveted those in and the drill the holes in the cover bigger to allow the 1/4-20 bolts to slide through. Please take note that the above pics are from both of my Foci. I did this mod to both of them. I did it this way because the cover has the exact same grooves and angles as the floor in the car and makes for a nice tight, flush fit. I'm not done with it yet. i plan to sandblast my covers and paint them. I'm also going to use some rubber edge trim and urethane weather stripping to seal the cover to the floor. i will edit and update the post as i do. Disclaimer: Do this at your own risk. This is just for reference. Nice job. Good writeup and photos. Haven't tried this in a car, but I pulled a 54 gallon fuel tank out from under the mid-berth of a Bayliner 24 foot cabin cruiser once. Only need to do it once. Growing old is unavoidable. Growing up is optional. Very helpful and detailed write-up. Great job. Who by worrying can add a single hour to his life? This has been super helpful. 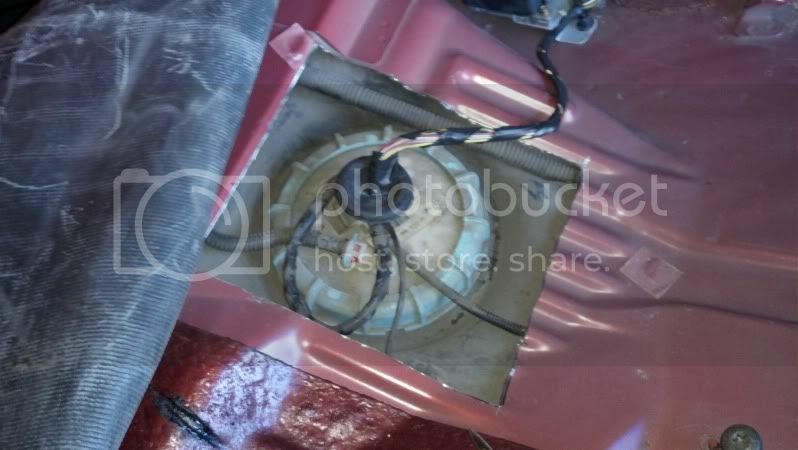 Any suggestion on how to pull up the carpet to expose the fuel pump without damaging the carpet? I like the way you used the flooring from another Focus to make a cover. 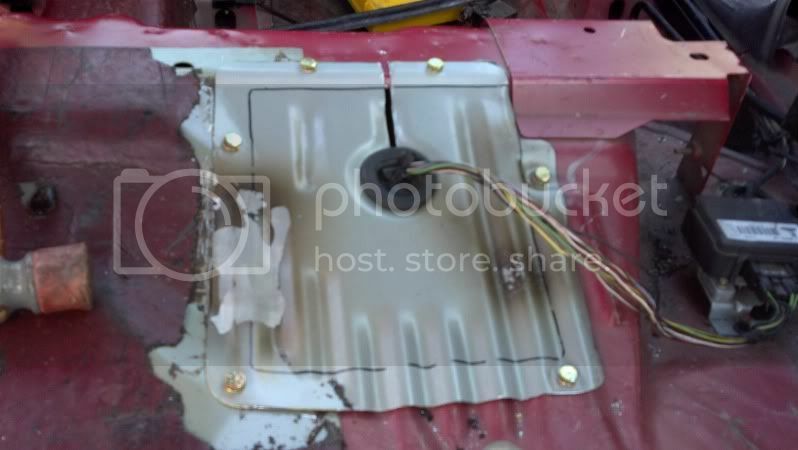 I wish I had cut my access panel, used a nibbler - too worried about the wiring underneath, a littler larger because that BLUE screw lid can be a b!tch to get back on and the cut sheet metal will slice up your hands. Probably won't have to open this up again on this car. 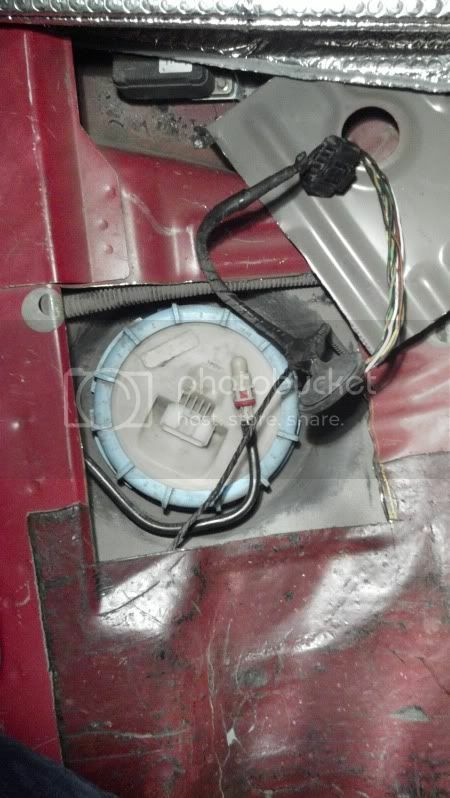 The other nice thing about cutting a opening for the fuel pump assembly is - it also provides access to the fuel filter hose connection in the pump assembles lid (black hose with the red male connector). 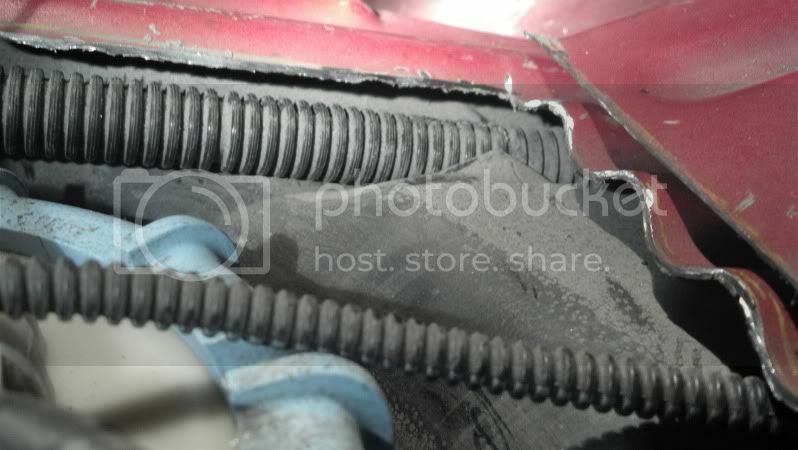 In the case where that hose gets damaged when changing a fuel filter and needs replacement. Member of the Dropped Valve Seat Club. Replaced #4 Piston, Rings, Rod+Bearings, AERA Re-Manufactured Cylinder Head and a light Hone. Then CLEANED the hell out of everything. 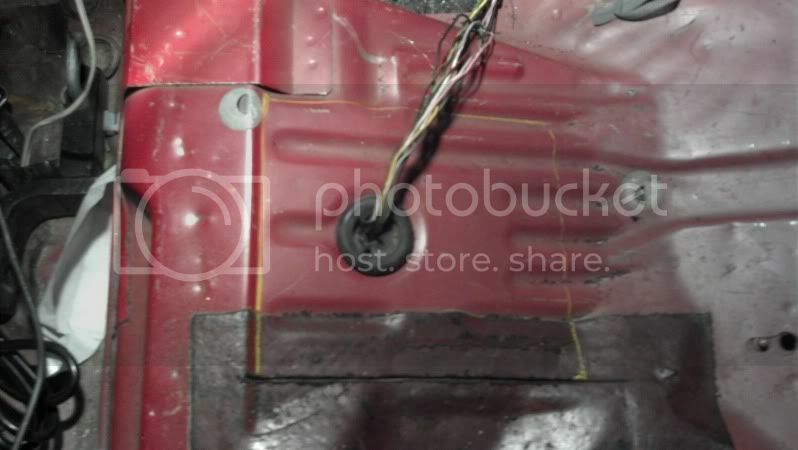 Would the fpdm connector not fit through the grommet hole? RTV will get you the best "complete" seal. Otherwise, good job! Your my hero!!! 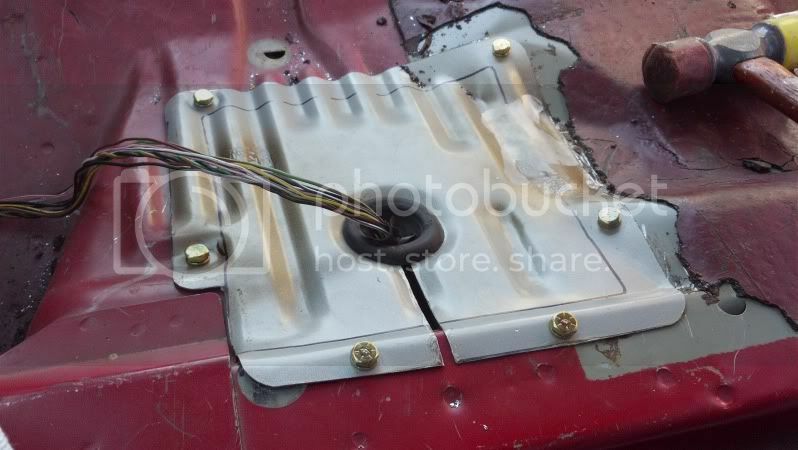 I followed your photos and did this on my sons 01' Sedan, and it worked perfectly it took about 1hour to open the floor, pull the sender and replace the pump. I hinged the metal piece that I removed and sealed it with Gorilla Tape. I also used a Dremel and the thick cut of wheels, spot on it took me about 1.5 wheels to make the cut. My Evap line was were it was supposed to be, so no damage at all!!!! What I Drive: 12 Focus fleet vehicles 00-05. Thanks for the write-up and especially the photos. I followed your instructions, and started out with the Dremel. The Dremel took about 20 minutes to cut one side of the square. Next I switched to a grinder with a cutting wheel. Much quicker - about thirty seconds per side. I was VERY careful not to cut too deep. I had a fire extinguisher handy because sparks were flying everywhere. Great deal of good the extinguisher would have done had anything gone wrong - probably I would not have had time to use it. I'm not a safety expert, so I don't know how safe this whole thing was. 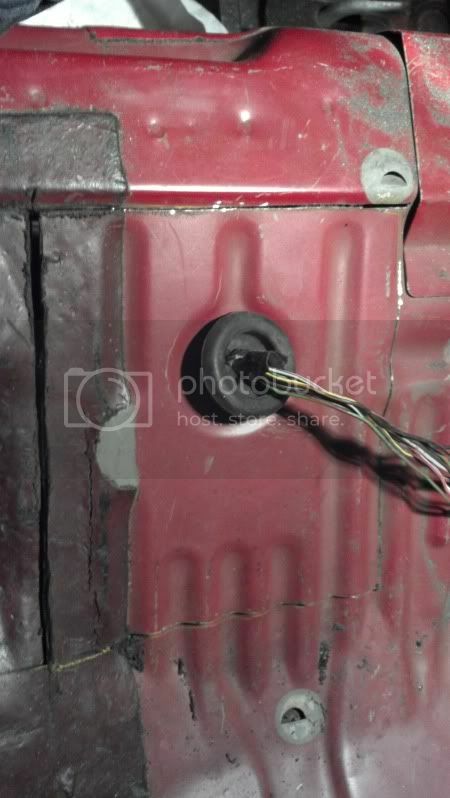 Sparks flying next to a fuel tank. I knocked the lock-ring loose with a flat-head screw-driver and a rubber mallet. I don't think it matters much what you hit it with. 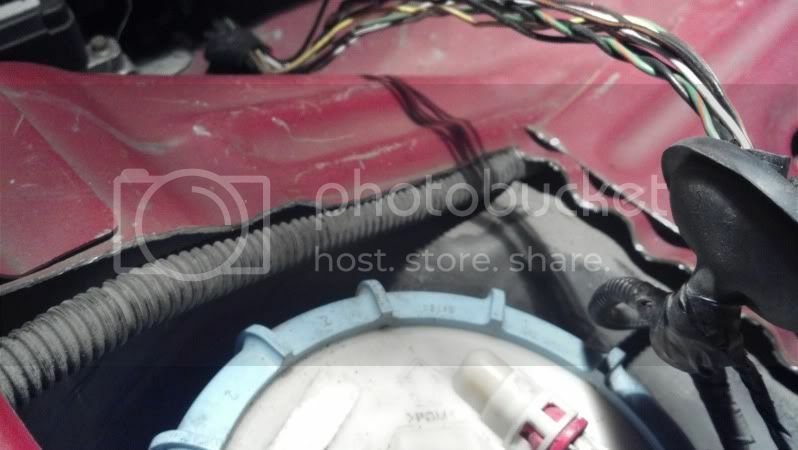 The pump assembly in my 2000 Focus SOHC SPI is held down with four flat tabs in the base - rotating the assembly engages the tabs into the bottom of the tank. It's different from any of the pump assemblies that were available at my local parts stores or anywhere online. To remove the pump assembly, I had to firmly grab it and rotate it counterclockwise. This disengaged the tabs from the bottom of the tank, allowing the pump assembly to be lifted right out. The assembly itself can be disassembled to access the pump. The assembly is held together by four push-in tabs near the top. Popping them open gives access to the pump inside the assembly. Neither of the two strainers that came with the new pump would fit inside the assembly. But I was able to pop the old strainer off the old pump with a small flat-head screw-driver. Then I pressed the old strainer onto the new pump. To put the plate that I cut back in place, I bolted some plumbing strap material across the plate and onto either side with 12x1/2 sheet-metal bolts. 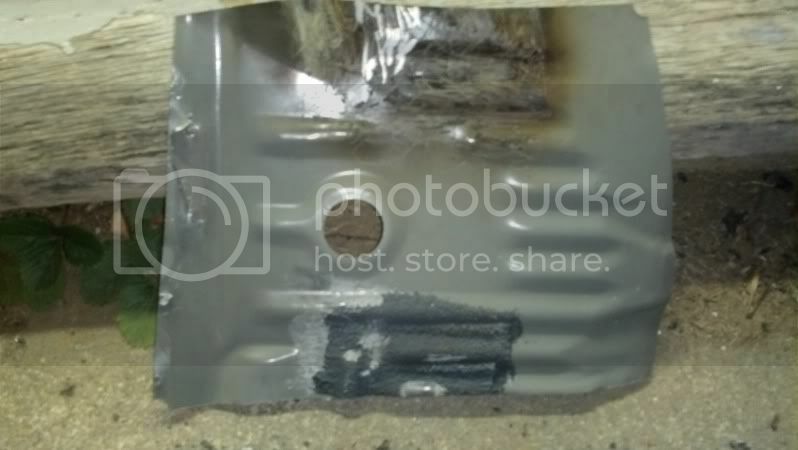 I drilled pilot holes with a 1/8 titanium bit. PS. Another interesting note. 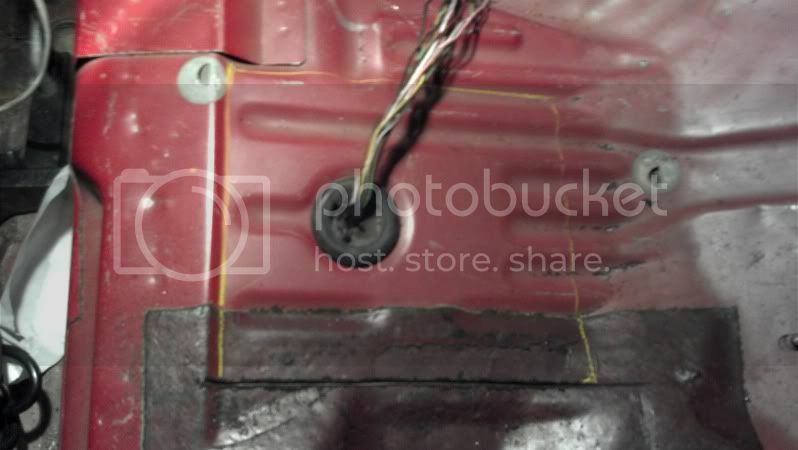 Before disconnecting the fuel line from the top of the pump assembly, I disconnected the pump's electrical harness on top then started the engine to de-pressurize the fuel lines. I thought the engine would die after a few seconds. Five minutes later, with no power to the pump, the engine was still running! Go figure.